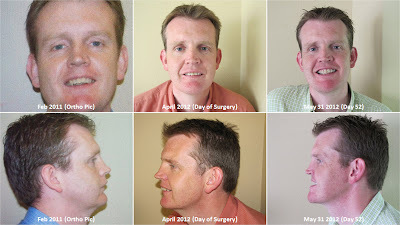 I mentioned in my last post about my profile and the comparison with 16 months ago when the Orthodontic work started. I have attached a picture on the left showing three timeframes; 16 months ago, the day before surgery, and then finally a photo taken at day 52 post-surgery. My jaw used to stick out but only because I sub-consciously projected it forward so as not to leave it in its default, recessed, position that you can see in the far left picture. 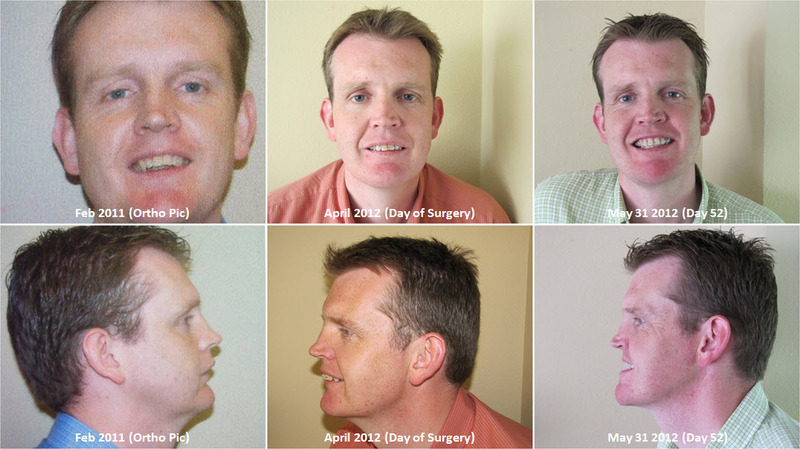 I find myself therefore comparing my jaw position, not with the picture from 16 months ago, but rather with pictures where I was projecting my jaw forward, and in comparison with the day 52 picture, I am not liking it. Facial Swelling affects the way your face looks and I know that my profile will change as the swelling decreases over the next year or so. Everything from my lips, cheeks, nose, forehead, is affected by the swelling but truthfully I have never been a great visualiser and so I find it difficult to project what I will look like next year! Changing the perspective from my side profile to how I look when see my face in the mirror: If you ignore my chipmunk cheeks, the non-existent smile due to the swelling, and the consequent freaky smile, I actually like the way I look in comparison! John, have you adapted to your profile yet? I see what you mean, but it doesn't look bad. In fact, I think it looks better than before. Your front looks younger, too.